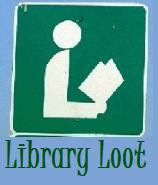 The Adventures of an Intrepid Reader: Library Loot with no loot! I have no loot, no loot at all to share with you all this week! That doesn't mean to say that I don't have any waiting for me, because by tomorrow I will have 9 items waiting to be picked up but I don't think I will get to the library until at least Saturday, maybe even Sunday! Unfortunately, in order to pick up those items, I am going to have to have some more booked Repo'd but I will think about that tomorrow! That doesn't mean to say that I don't have library news to share. Monday was a big day for library users in my area! A brand new branch opened, filled with lots of brand new items, in fact, around 40000 of them, with the local council having spent more than $1 million on the inventory! I have also heard that there is going to be another branch built in the next year or so which will be much closer to my house! Have to be happy with that! For me, it is like Christmas, as there were a whole heap of books that were on the catalogue but not available to request because they had been purchases specifically for the new branch! Of course, I have so many items out that I can't borrow any of them at the moment, but I will! As well as all those lovely new items to borrow they apparently have state of the art check in/out technology and a wi-fi zone as well. I haven't been there yet, but I am sure I can find a reason to drop down there soon! So, do you have any loot you would like to share with us all? Yay! New inventories to explore! How cool!! I'm very excited for you!! My loot's been small the past couple of weeks, too. Too many books out that I need to catch up on. I have no loot either :( Enjoy your new library! How awesome that you have a new library in town with lots of goodies waiting for you to explore! I hope you get the chance to enjoy it soon. Living in a country that seems to be set on cutting library services it is lovely to read about a new library. I have just the one book, but a pile of reservations to pick up. why is it that they all arrive together in a rush?! going into a BRAND SPANKING NEW library would be so very cool!!! New libraries are a lot of fun!! It was very cool to go into a brand new branch, except for the fact that some of the technology wasn't working properly even though it had only been used for a week! Fleur, I have no idea why books on hold always arrive in a whole bunch, but it does seem to be a world wide phenomenon.